How much does it cost to travel to Hue? How much money will you need in Hue? d915,064 ($39) is the average daily price for traveling in Hue. The average price of food for one day is d196,436 ($8.46). The average price of a hotel for a couple is d1,169,088 ($50). Additional pricing is in the table below. These average travel prices have been collected from other travelers to help you plan your own travel budget. How much money do I need for Hue? Hue is a major city in central Vietnam and was historically the imperial capital. The city was the base for the imperial Nguyen Dynasty, which ruled from 1802 to 1945. During the Vietnam War the city faced many challenges. It was conquered by the Viet Cong and held for 24 days. During this time about 3,000 people were slaughtered for their political views, education level, or religious affiliation. 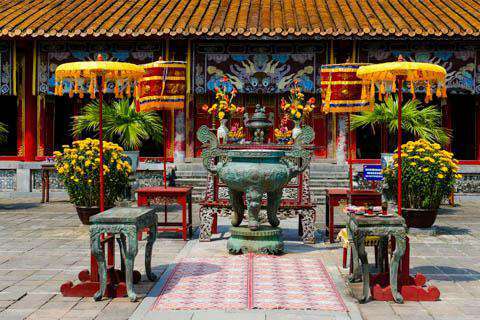 Today, Hue offers visitors a unique experience with a vibrant atmosphere and rich culture. Many people stop in Hue on their way between Hanoi and Ho Chi Minh City. Hue has a tropical monsoon climate. The dry season is between March and August, when high temperatures can climb above 100 degrees Fahrenheit. The rainy season is from August to January, and the flood season is from October onwards. Temperatures in the rainy season average 68 degrees Fahrenheit. As the former imperial capital of Vietnam, there are some great sights around the city. Make sure you visit the Imperial Citadel and the Tombs of the Emperors, both of which are highlights of the area. The Imperial Citadel is the former seat of the government and has a large complex of temples, pavilions, moats, shops, museums, and galleries. The Tombs of the Emperors are located on the Perfume River to the south of the city. They are best visited by river boat cruise. Other interesting sights in Hue include Thien Mu Pagoda, Thanh Toan Bridge, and Phu Bai Airport. Hue is divided by the Perfume River or Huong Giang. On the north side of the river you'll find the city's old town and the Citadel. On the south side you'll find most of the city's restaurants and hotels as well as the newer and modern city center. There's a lovely promenade and park area that runs along the riverside, making for a nice place to stroll. Check out some of the unusual sculptures along the way. There are also some interesting tombs that are further outside of town in the outskirts of the city. There are many different activities that you can enjoy while you're in Hue. Motobike tours of the area are common. There are both day trips and multi-day trips that take you to the nearby town of Hoi An. Other activities in the area include visiting the Alba Thanh Tan Hot Springs, going to My An Hot Spring and Spa, visiting Thuan An Beach, or enjoying a city sightseeing and food tour. If you're interested in good Vietnamese food, there are some great local specialties around Hue. The city is famous for its Imperial cuisine, which was typically served for the emperor. An imperial banquet is a unique experience that is worth trying if you have the chance. There are several traditional local dishes in Hue. Bun bo Hue is a noodle soup with beef slices that is popular and ubiquitous. Nem Lui is made with minced pork that is cooked on bamboo sticks over hot coals. Banh Khoai is a pancake that is stuffed with bean sprouts, shrimp, and pork. Bun Thit Nuong is a barbecued pork that is served with vegetables and noodles. Banh Beo is an appetizer of sticky rice with shrimp and pork. It's usually served with a sweet fish sauce. Also make sure you pick up a box of the locally made sesame candy which is quite tasty. Your options for traveling around Hue are similar to those in other Vietnamese cities. There is no shortage of cyclos, motorbikes, or taxis around town. Generally, the meters are a reliable option in Hue and you can expect the drivers to rely on their meters. Trips usually start somewhere around 15,000 dong for about two kilometers and then climb upwards from there. If you suspect that the meter has been tinkered with, mention calling the police and the driver will back down. A trip to the tombs on the outskirts of town should cost roughly 300,000 dong, including the wait time. With motorbikes, negotiate a fair price and walk away if they do not agree to a price you consider reasonable. There are no shortage of motorbikes or cyclos so you will find someone else who is more fair in their pricing. You should not have to pay more than 20,000 dong for a trip within Hue. Looking for a hostel in Vietnam or Cambodia? Find party hostels in Vietnam or Siem Reap or find the best place to stay if you're traveling alone to Ho Chi Minh City.